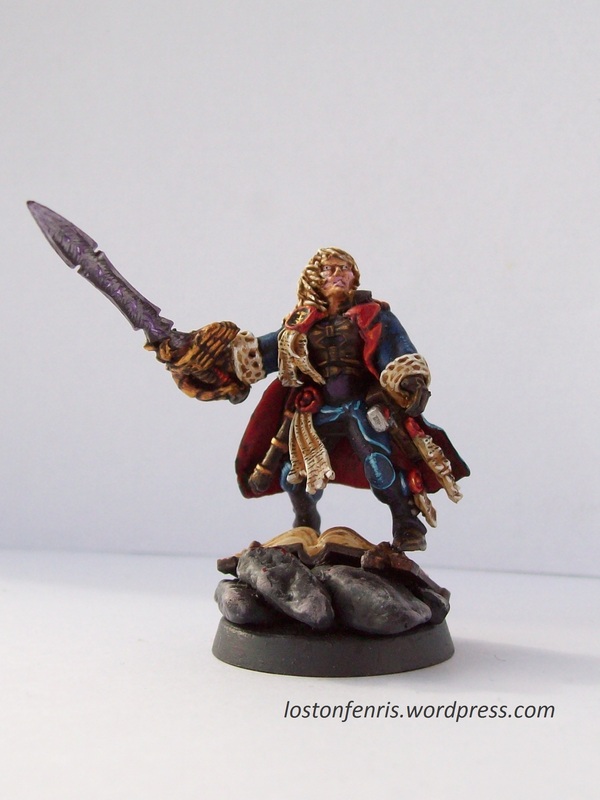 In a fit of drunken grumbling three weeks back, I found myself bemoaning the loss of the female Inquisitor model by Games Workshop. At some point I realised that I had some female Dark Eldar bits kicking around and decided there and then to kitbash my own. I used a set of Eldar Guardian legs as they are fairly slimline while the torso came from the Dark Eldar Hellion box, as did the head and arms. The sword came from the Dark Elf Cold One box while the bolt pistol and parchment cases came from the Space Marine Tactical Marines kit. 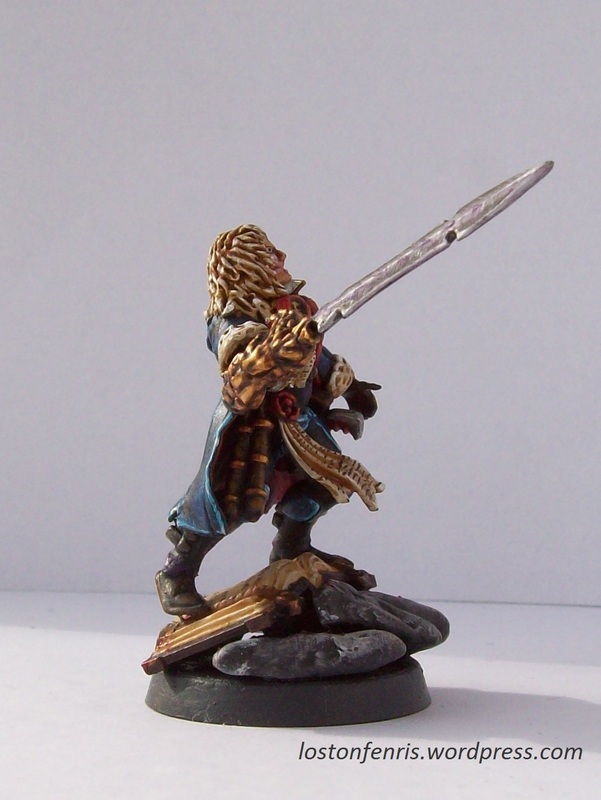 Next I sculpted the coat, sword hilt and hair from green stuff. I did this in several stages so as not to damage any of it. I started with the skirts of the coat, which I built by cutting panels out of soft green stuff and fixing them together on the model. When they were almost set I built sleeves round the arms. Only when these were set did I add the cuffs and lapels. The hair I added in several layers in order to get enough fullness. One great thing about green stuff is that it freezes, so that you can happily pause between layers, stick the leftover green stuff in the freezer for anything up to two days, then, when you’re ready for the next layer, warm the frozen green stuff in the palm of your hand and you’re ready to go again! Most of the purity seals came from the Tac Marine box, although the big one came from the Ravenwing box (as did the book on the base). 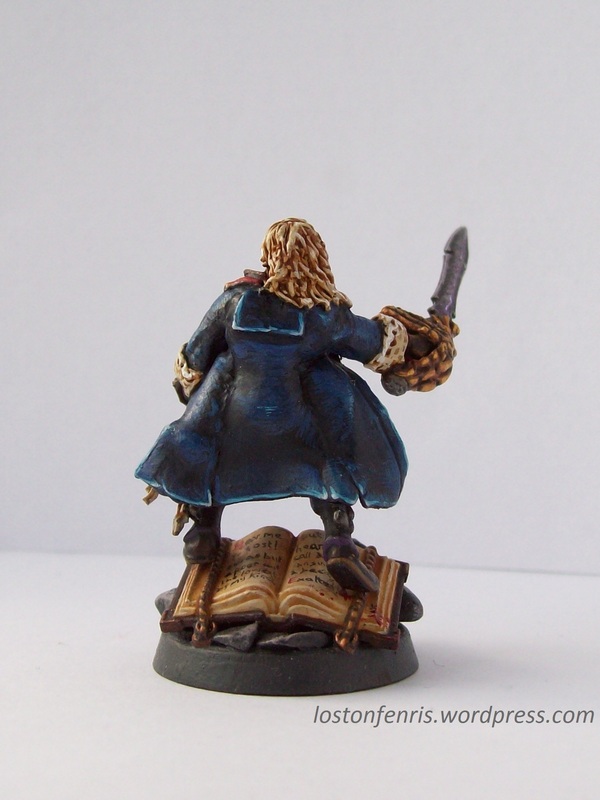 I posed her standing on a heretic tome as she will probably be played as an Ordo Hereticus Inquisitor eventually. 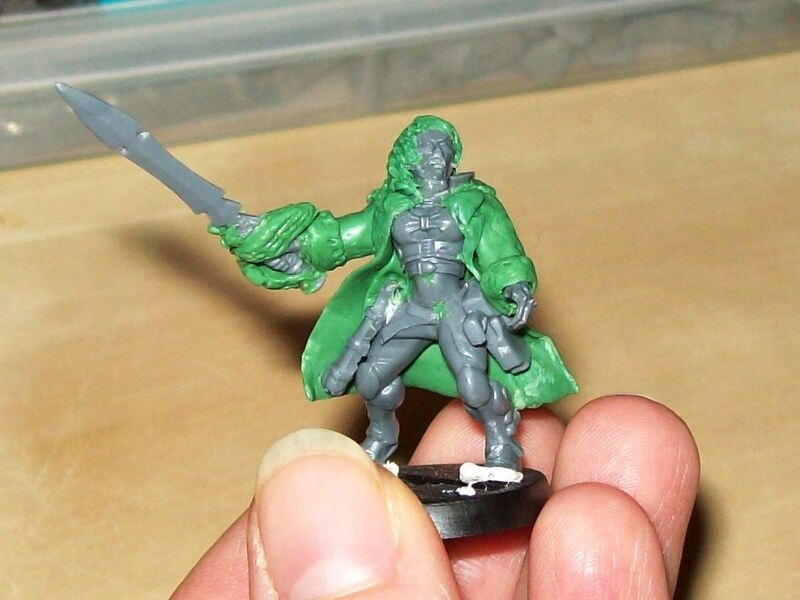 Hopefully I will build a retinue to go with her when I have the bits and the inspiration to go with them! Blogging, grumbling and trying to be mildly positive! So the new White Dwarf Weekly and Warhammer Visions have been out for over a week now. I was going to write a blog post on my opinions of them but I found that I didn’t have the heart. It’s not the quality of the magazines (I quite like the new White Dwarf Weekly, not so much Visions) but the general atmosphere right now. Maybe it’s just the 40K sites I frequent but it feels as if there’s a lot of kneejerk negative reactions to 40K and Games Workshop right now. It feels like as if as soon as something is even rumoured it’s bitched about. It’s not that I never criticise Games Workshop, I snaffle and snark all the time about little things and we should all do that, sometimes it’s important to complain, but I’m not sure that the genuine complaints are noticeable above the general, loud low grade moaning at the moment. The other thing is that a lot of the malicious stuff is now actively spoiling my hobby. I’ve cut down the number of sites I visit (there’s enough to be worried about in real life, I don’t need to get riled up over the latest silly rant) and even the number of podcasts I listen to and its really affected the way I blog. It’s all irrational, I know that opinions are only opinions but I get the impression now that if Games Workshop were to announce a free set of rules complete with a complete (and free) set of models delivered to your door, someone would complain that the models weren’t pretty enough, the rules didn’t auto-destroy Tau or that they just took too long to deliver. It’s like being surrounded by Private Frazer clones! I know that the traditional way to chill out online is with a cute picture of some kittens. 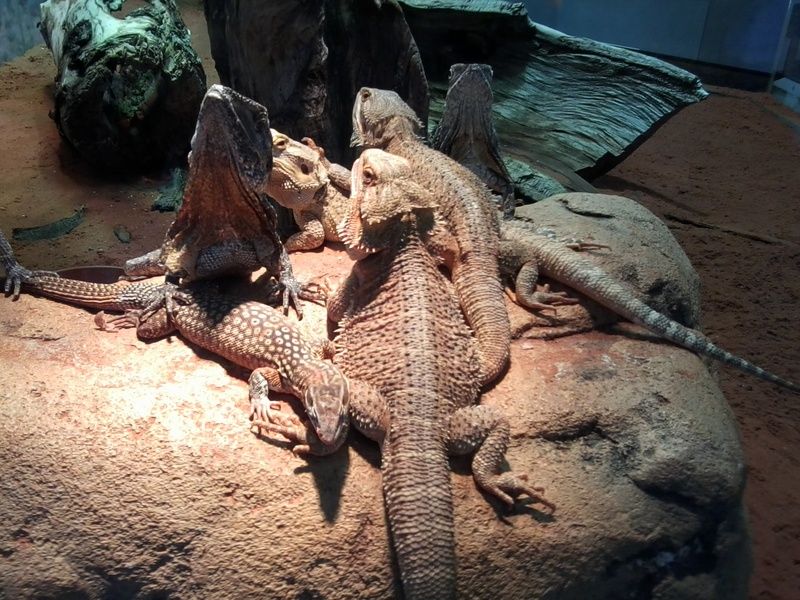 Unfortunately, the only kitten photo I have is of my Mum’s leggy example demanding attention, so here are some happy reptiles instead!